This is Ponta Delgada’s main church among the many places of worship this city is endowed with and its high tower - the only one in the city, which has a clock  can be seen from far. The parish church of São Sebastião is centrally located, at the Largo da Matriz, near the Portas da Cidade, and is often referred to only as the ‘Matriz’. 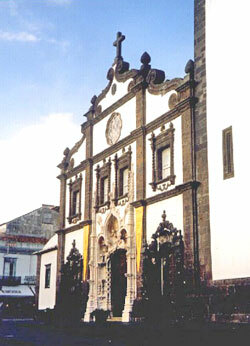 Built between 1531 and 1547 on the site of a small chapel dedicated to the first patron saint of the island, this originally Gothic structure also shows Manueline-style traces, typical for the Portuguese architecture in the 16th century, on its exterior, particularly to be seen on the magnificent portal of its main façade. In the 18th century, the main façade underwent some great changes in the Baroque style of those days. 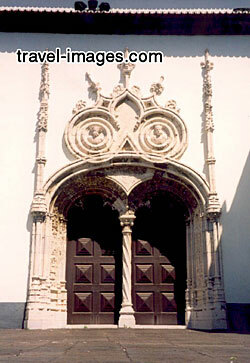 Two lateral doorways were added to the main portal and a rosette and four windows were built. The interior is lavishly decorated with carved cedar and other exotic woods, such as lignum vitae, a magnificently carved altar and choir stalls, interesting paintings from the 17th and 18th centuries as well as beautiful jacaranda furniture from Brazil from the 18th century, glazed tiles and a valuable collection of gold-embroidered liturgical vestments from the 14th century, which can be seen in the sacristy. The windows are adorned with colourful images of saints.